Size of Male: 130-150 lbs., 28 in. Size of Female: 100-120 lbs., 26 in. Called “Newfie” or “Newf” for short, the Newfoundland dog is a gigantic breed famous for its friendly character and rescuing prowess. If you are searching for a sweet-natured dog that revels in your presence and welcomes swimming activities with gusto, the breed will not disappoint. Newfoundlands make outstanding companions for closely knit families in a grand home. Newfoundland, Canada, is the documented cradle of this large dog breed, although other accounts will also point you to Labrador, Canada, way back to 1,000 A.D. The dogs then aided fishermen in hauling nets while doubling as water rescue dogs. When not saving lives, the breed served as draft dogs on dry land. Visiting Europeans were so taken by the Newfoundland dog’s usefulness that they took the breed with them and introduced the dog to the English show ring. The end of World War II marked the proliferation of the breed. Today, you not only see Newfies as lifesavers, but also as adorable and devoted pets that are guaranteed to delight owners and house guests alike. Despite their massive bulk and scary bark, Newfies are far from formidable. They are considered one of the friendliest canine breeds around. If you have guests coming over to a house party, you shouldn’t worry too much about their causing a commotion. These pooches love attention and socialization. In fact, they tend to suffer from separation anxiety and exhibit destructive behavior when left on their own for too long. Some males may act aggressively around other male dogs. Living Environment – The Newfie cannot survive hot climates. So, if your home is situated in the sunny side of the planet, the breed may not be for you. The dog’s size makes apartment living a cumbersome affair. The recommended living environment is a huge home with a spacious yard to match – and a household without frail members and very young kids. Access to a body of water such as a pond or a lake is ideal. Grooming – Brace yourself for frequent cleanups. The Newfoundland dog is a drooler and a heavy shedder! Experts recommend dry shampooing and regular brushing. You will need to step up the coat care during spring and fall. The breed actually sports a double coat: a soft undercoat and a coarse outer coat. It’s not surprising why Newfies can withstand chilly weather and chillier waters. Diet & Exercise – In the dog’s first 18 months, you will need to serve generous portions of high-quality canine food. Thereafter, you must reduce the serving size to prevent rapid weight gain. Nothing fancy is required. What is crucial is that the meals contain fats, proteins and natural supplements. Poultry, fish and lamb are excellent choices. Taking care of your pet’s exercise needs is a finicky matter. The requirements are generally minimal. Daily short walks are the norm, but if you want to give your pooch a special treat, schedule a leisurely swimming or fishing trip over the weekend. Remember to avoid letting the dogs exhaust themselves in physical play. The breed has soft bones and ligaments that can easily be injured during frequent overexertion. 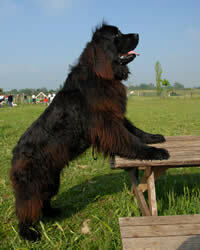 Health – The Newfoundland dog is not a Spartan in the canine world. Apart from its oversensitivity to hot climates, the breed is relatively short-lived. The dogs sport a high risk for the following health issues: gastric torsion, chronic heart diseases, cancers, joint diseases, bone diseases and cataracts. The list can actually go on and on. Heart, eye, blood, elbow and hip tests are strongly recommended. The Newfoundland dog breed requires a patient and gentle, yet firm handler. Positive dog training methods work best. Newfies are quite sensitive to the tone that you use. Harsh words can make or break the dog’s training. Between the male and the female, the former is likely to sport an aggressive streak. Early socialization and exposure to obedience routines are encouraged to facilitate ease of housebreaking and training practices.